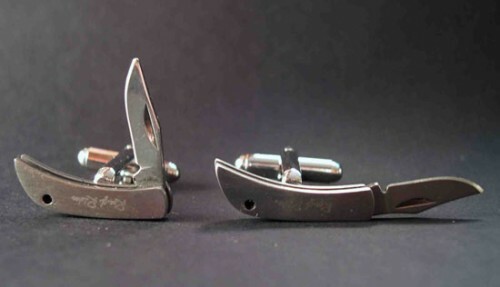 These Stainless Steel Knife Cufflinks Look Sharp | OhGizmo! By David Ponce on 12/02/11 • Leave a comment! While we wouldn’t recommend wearing these for a trip to airport security, pretty much any other occasion can be enlivened by wearing cufflinks that are also tiny functional knifes. Measuring 7/8 in. closed, the blade itself is 9/16 in. in length and features a little notch to open them. They’re perfect for opening letters, boxes and stabbing people once you get into a drunken fight over whether Chuck Norris could take on Kimbo Slice, blindfolded (he could). The company even thought of including a tiny diamond dust sharpener so you can do it all over again as soon as you get out of jail.